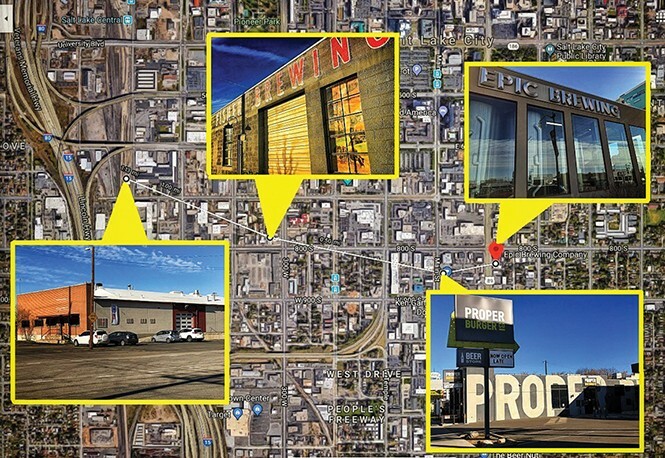 Last summer, I scoped out what I dubbed the Midvale Brewery Mile—three breweries that stretch down 7200 South in Midvale. Now, Salt Lake City's exploding beer scene has its own beer mile running from State Street to 600 West. You should take a stroll through this gauntlet as well—hell, it's only a mile. Epic Brewing Co. (825 S. State): Stop No. 1 begins at the headquarters of Utah's largest locally owned brewery. The Epic beer machine currently operates four breweries in three states; the main brewery on State Street in Salt Lake City, the brewpub at Dolce Sicilia in Sugar House, The Epic Brewery in Denver, Colo. and the newly acquired Telegraph Brewing Co. in Santa Barbara, Calif. As you begin the SLC Beer Mile, you'll be met with one of the largest selections of high-point beer from any brewery in the state. Epic's Tapless Tap Room might be small (only six seats total), but you can get any beer that Epic brews by the glass or bottle. I recommend checking out their oak and orchard barrel-aged sour beers along with their Citralush Northeast style IPA. Proper Brewing Co. (857 S. Main): The brainchild of the Connolly brothers (Liam and Rio) is part of the Salt Lake City-based Proper empire. It includes the group's first brewpub, Avenues Proper Restaurant and Publick House; Proper Brewing Co., the main production brewery and taproom; and Proper Burger, a gourmet burger joint located across the parking lot from the brewery. Just like Epic, you don't have to buy a full bottle of high-point beer (though you can if you want) to hang at the brewery's pub. You also have the advantage of a dozen drafts to choose from. On the second stop of the SLC Beer Mile, I recommend the Leisurebrau India Pale Lager and the Foreign Gentleman Coffee Stout. A. Fisher Brewing Co. (320 W. 800 South): Originally started back in 1884 by German immigrant Albert Fisher, the Fisher Brewing Co. quickly became one of the the largest breweries of its time, even surviving the dark days of Prohibition. Sadly, the Salt Lake City brewery closed its doors in the mid 1960s and was thought to be lost to history. It was 133 years after its founding that four men—one of whom, Tom Riemondy, is a descendant of Albert Fisher—resurrected Utah's most historically successful brewery. Co-owners Riemondy, Steven Brown, Colby Frazier and Tim Dwyer have created a phenomenon in Utah's craft beer scene, concentrating on small batches of draft beer with constantly rotating beer styles. Stop No. 3's must try beers include the Fisher Classic Lager and the Fisher Mild Ale. Kiitos Brewing Co. (608 W. 700 South): Kiitos—pronounced "kee-tose," which is Finnish for "thank you"—proclaims themselves as Utah's most earth-friendly brewery. They've only been in existence for three short months, but in that limited time, they've been taking SLC's old Granary District by storm. The green brewery was created by owner Andrew Dasenbrock to produce all manner of beers, ranging from double IPAs to dark and creamy coconut stouts. You'll never see the phrase "session IPA" here, but you'll get a rotating array of single-hop pale ales that definitely taste like them. On the final stop on the SLC Beer Mile, the rotating pale ales and the coffee cream ale are definitely worth a swig. Most of these breweries specialize in seasonal and alternating offerings, so your beer mile experience will change over time. I guess that means you'll have to make the trek multiple times, just to be sure. As always, cheers!